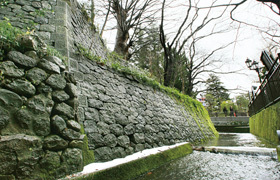 The second Lord Maeda, Toshinaga, constructed a double ring of moats and embankments encircling the central areas of the city to strengthen the castle defences. These were dubbed “enclosure moats” (sougamae-bori) in the Tokugawa period, and were also built in major cities like Odawara, Kyoto, Osaka, and Fushimi, but aside from Odawara, most of these have now been filled in and few remain. Kanazawa's enclosure moats lack their original embankments, but almost all the moats remain as canals, providing an excellent example of remaining enclosure moats in Japan. The third lord, Toshitsune, assembled the temples into temple districts, and also constructed a 4km road to the coastal port, Kanaiwa. There was extensive reorganization of the samurai and townsmen areas after the two great fires of 1631 and 1635, following which the strict division of residential zone by class - samurai, townsmen, and temples - was put in place. As a results, Kanazawa in the middle of the 17th century had been made into a city worthy of a million-bushel daimyo. While there was expansion out into the surrounding countryside of samurai and townsmen housing, the central form of the city remained even following the 19th century Meiji Restoration. After the Meiji Restoration, regional divisions of the army and high schools were set up in the castle and central Kanazawa, forming the core of the modern city. The sacred mountain of Nodayama, to the south of the city, was given new meaning in the modern era as well when the graves of the war dead and general citizens joined those of the Maedas (a National Historic Site) to form a large sacred space. Modern development of the city left most of the older roads intact, and thus the bones of the castle town still remain. 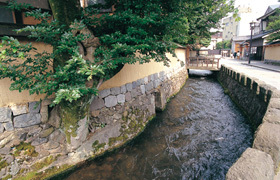 The historical and cultural sites, and the urban landscapes, that use nature in this way are linked to Noh, the tea ceremony, Japanese cuisine and confectionary, haiku, and other traditional culture, and to traditional arts and crafts like gold leaf, lacquer, woodwork, and metalwork, and even now form an indispensible part of the citizens’lives. Ishikawa Prefecture and Kanazawa City have focused on this aspect, considering that the many historical remains and the traditional way of life linked to these form a single historical urban cultural site, and in 2007 proposed its listing as a World Heritage site. Copyright (C) 2014 Council to Promote World Heritage Inscription in Ishikawa Prefecture. All rights reserved.